Meet Brad Visman, a fourth-generation General Manager of family-owned Boa Vista Orchards in Placerville, CA. 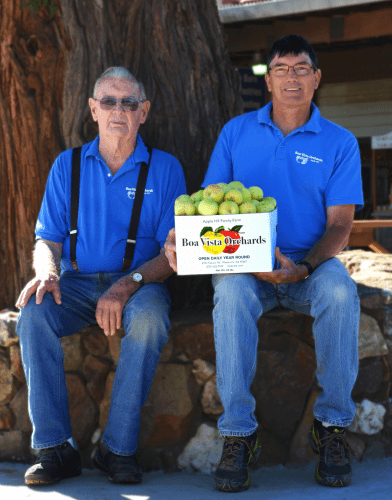 Find out what fruits are, “the apple of Brad’s eye”, how he got a head start on farming and why his family’s farm has been successful for more than 100 years! Brad: Actually, we’re testing a few varieties of apples to see how far off they are for harvest. We’re also picking some pumpkins and bringing them in and we’re also packing and sorting some apples today too for the store. Brad: It’s very challenging. It involves a lot of farming and of course we have the retail part that we do, but I get to plant new varieties of apples for next year and varieties that we need more of. We have quite a few new varieties from the last few years, so that’s a fun part and we’re going to replant some new peach orchards with new varieties. Another fun part is getting the harvest in and getting them packed up and ready for sale for our customers. Most of our customers wait for their favorite things to get ripe, so they’ll come in when we let them know that we have it and that’s pretty rewarding because they like the stuff that we grow and they like what we do. We grow Asian pears and we planted some late season pears that harvest in late September and October out here, which is pretty exciting because people like fruit and they like to eat it and they don’t like it when it goes away and isn’t in season. So we try to plant some other varieties of apples and pears that people like so we can extend the season for them. It’s kind of fun to see what we can grow and how good we can do with them. Brad: That’s actually another fun part of my job that I really enjoy. We do a lot of giving back to El Dorado County for schools, projects and a lot of other organizations every year. There’s a set of grammar schools up here that have a big day where they have a bunch of schools involved and we donate apples to all the kids and it’s a really fun event. And during the Christmas holiday, we have a couple organizations that I joined last year – the Boost Club and Kiwanis – and we made a bunch of Christmas baskets full of apples and different foods. We gave those out to a whole bunch of families all over the county and that was a lot of fun. Brad: Number one, I think that if someone really wants to get into farming, they need to ask themselves “do I really want to do it?” You might think you do, but you don’t know until you get out there and get involved. There are a lot of opportunities in farming for people to get involved if they really want to do it. It’s not going to be a lucrative thing if you’re motivated by making money, and if that’s a big concern for you, it might not work out. It’s really not about the money. For me it’s about family since we’re a multi-generational family farm and I got involved in it a long time ago when I was a kid growing up and I liked it. The lifestyle is also very different than most folks can associate with because we’re not only farmers, which is a huge commitment and responsibility by itself, but we have retail and food service too. We’ve just been very fortunate in many different ways to be where we are now with all that we have. My parents and grandparents were just amazing because without them, we wouldn’t have any of this and there’s been so many sacrifices from them, I can’t even describe what’s been done here for the last 100 years. Brad: I was born on the farm, so a lot of my interest just happened naturally because I was around it all. I had opportunities to do other things of course and I did do some other things and had some other experiences, but this is what I ended up being because I was here and I just love what I do. It’s a hard life and I think that’s what makes a lot of people not pursue it. CA GROWN: What’s your favorite part of the farming process? Brad: My favorite part is harvest and the fall season. Every year is different when it comes to production agriculture and that’s what makes it so interesting and hard. It starts off with pruning and taking care of the orchard and getting the weeds out and watching the bloom season and the crops. Throughout the spring, summer and fall is probably my favorite part by far because we see it all happen, what crops made it through and the different varieties and how they’ve done. We leave them on the tree as long as we can to get as ripe as they can and that whole process of getting them in, tasting them and getting them out to people who come to get what they love is awesome. Brad: We don’t travel too much. We like to just relax when we can and I like to ride road bikes and mountain bikes, I’ve gotten really into that the last few years. I do like to play golf and I’ve played since I was a teenager. CA GROWN: Your family’s farm has been open since 1915. What has contributed to your success so far and what are you doing to ensure continued success going forward? Brad: That’s a great question. In the beginning, it was pretty basic farming. There wasn’t a lot of equipment or help and the irrigation system wasn’t good. Back in the day, my grandfather started planning the experimental varieties of plums and pears and over the years, between my grandfather and my dad, diversification was probably the biggest thing for us. My dad started farming when he was young and took it over from my grandfather and he planted all the experimental varieties like my grandfather to see how it would grow up here. That’s what we’ve continued to do is diversify with existing varieties over the years and some new varieties and that’s another fun part of this job is finding these other varieties of apples that nobody has or that already exist, but we’ve never grown up here. Part of our family progression has been diversification and planning through the season and extending our whole year here with what we do. That’s a double edge sword of course because we’re planting all these different varieties, not only apples but pears, Asian pears, peaches, nectarines, blueberries, blackberries and a few acres of wine grapes. So with that diversification, the cultural practices side comes in with taking care and farming all of the different crops and varieties and their different timing for harvest which makes the work very challenging. My wife has also been a big part of this farm and has made a lot of sacrifices, but we love what we do and I’m thankful for her and my parents and all that everyone does to make this farm successful.